Monumental Flanders – A documentary about cycling in Flanders and the Ronde – 2013 from Cycling in Flanders on Vimeo. Yes, riding the amateur classics routes, Paris Roubaix and De Ronde most of all, getting splendidly drunk on fantastic beer with great people afterwards, then watching the pro peloton smash the cobbles. Then doing the whole thing again. Please? Can I do that? Please? Quite a few of us are hanging out for the start of Classics Season. For my part, the non-stop excitement of the Tour Down Under has given way to the expected snoozarama of the Middle Eastern Tours, and it’s proving painful. So, as a service to us all, here’s a recap of my two favourite Classics from last year. This should keep us going until Milan – San Remo on the 23rd March, where the one-day season kicks off proper, followed by E3 Harelbeke on 28th March, Gent-Wevelgem two days later, then the big two, Ronde van Vlaanderen and Paris – Roubaix on the 6th and 13th of April. 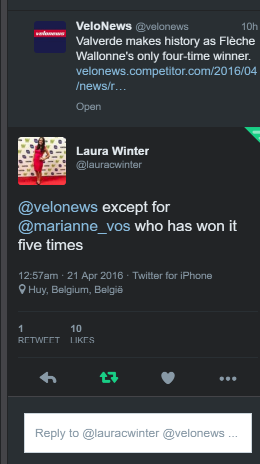 Not to mention Amstel Gold (20-4), Fleche Wallone (23-4) and Liege-Bastogne-Liege (27-4) after that. April is going to be epic. If I could hibernate from now till then, or take a time journey, I would. Especially since I’m injured at present and can’t race or train hard until my elbow heals up. Whaddaya mean I’m racing the next day? Aaaaaaagh. … and I’m not just talking about Mike Tomalaris’s 90′s haircut. This is stage 17 of the 1998 Tour de France, disrupted by the peloton in protest against heavy handed treatment by anti-doping authorities. Fun suggestion: play a game of spot-the-doper as the peloton rolls through the French countryside. Hypocrites to a man, they stood in solidarity with the – apparently few – clean riders, all the while knowing what was going on back in the hotel. Screw those guys.